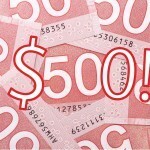 Refer a Friend and Receive $500! It’s simple really… If you know someone who might be interested in receiving a Maritime Car Loan, simply fill out the form below with their contact information. If they purchase a car through Maritime Car Loan, you’ll receive $500 from Maritime Car Loan, no strings attached! Please confirm your information so we'll know who to credit the $500 for upon approval.